Biogaz Europe is the reference event for biogas in France. The event encompasses an exhibition, conferences, study tours, the innovation competition, international business meetings and more. The event is organized by bees. The Exhibition Biogaz Europe will happen at ExpoNantes le Parc, in Hall “XXL”. For more information on the Parc, click here. 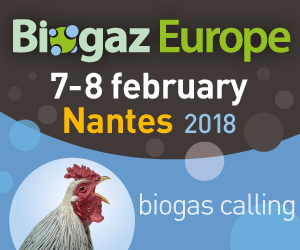 Biogaz Europe open its doors for 2 days on Wednesday 7th and Thursday 8th February 2018 from 9am to 6pm. 4000 professional visitors are expected over the two days covering farmers, project developers etc, agro-alimentary professionals, water treatment professionals, energy professionals, local authorities and policy makers. 250+ international exhibitors and represented companies are expected in Nantes in 2018 from across all of Europe. Exhibitor List 2017 is accessible online. A rich international Programme of Conferences is currently under development covering subjects relating to biomethane, co-generation and a “quality” approach to anaerobic digestion. The pressing themes and issues of the day as well as future horizons are all embedded in a rich programme of conferences covering the two days. The detailed conference programme will be published here during the month of december. Study Tours to local special sites of interest can be attended the day before the exhibition opens, ie the 6th February. Online registration is obligatory in order to attend. More details will be published here soon. Visitors and exhibitors can participate free of charge in the International Business Meetings sessions in parallel with Biogaz Europe, organised by the CCI Pays de la Loire and Entreprise Europe Network. Ahead of the event, registered participants will be able to request meetings with each other. A few days before the event, participants will recieve their personnal meeting schedule in order to optimise their time during the Exhibition. Participation is free of charge. The business meetings are organised through the Enterprise Europe Network. Click here to register and participate in the business meetings. The Biogaz Europe Innovation Competition and its prize award ceremony are always a highly anticipated moment of the event. This Competition, open to all Biogaz Europe exhibitors, awards a “Biogaz d’Or” and one or several “Biogaz d’Argent” to the most significant innovations of the year. These innovations may be products or services, and are judged by a jury of professionals, known for their experience and impartiality. The 2018 award ceremony will happen on Wednesday 7th February 2018. For more information about biogas in France, visit Biogaz Europe’s website.